October 6, 2010 — You’ve all heard the axiom, “friends don’t let friends drive drunk”? But the same advice is wise in cases of drunk dialing, tired driving and tired and/or drunk blogging. So, thanks a bunch you non-existent Twitter friends who shall remain nameless (GARY and Sahar, and @FringeLive and quite possibly Darrell. Darrell?) I’M HERE, I’M EXHAUSTED, AND I’M THROWING EVERYBODY UNDER THE BUS!!!! **did I mention, please disregard any typos, because I just don’t care anymore? It’s 2:45 AM EST and I finally made it as far as Roanoke. I hope this is in Virginia and that I’m at least in the general vicinity of our Nation’s Capital sometime tomorrow. I also hope to gaze with somewhat less bleery eyes at my Fringe Report lads who very clearly need den mothering. No comment on my Massive, Dynamic find in Mississippi of the Brandon Watertower? How dare they? But before I get in too deep with the negativity born of road rage, let’s step back to the lovely way the day began. I was cuddled up with soft pillows and blankets in my cousin Margie’s absolutely fantastic condo near Atlanta. I forced Marge to listen to my blog ramblings from last night, giving her a case of the giggles. Of course she doesn’t get most of the Fringe references, but I’m convinced she could soon be a convert if she’ll DVR it on Thursday nights. C’mon Margie, join the Cortexifans! She could launch a whole new demographic of the Fringe Report Fans within this semi-retirement community. She describes it as living in a dorm. Even though you each have separate living spaces, everyone’s always popping in and out of everybody’s business, organizing book clubs, charity events, fitness groups, card games and trips. So why not start a Fringe night? I washed the dust from the 1000 miles trail from my frame and felt renewed for the next leg of the journey == scenic trails through Asheville, NC, then some cruising on the Blue Ridge Parkway. Weather continues to be beautiful and snappishly autumnal. My ears were already sore from popping to the elevation changes driving up to Asheville. It was almost sundown when I entered the southern end of the Blue Ridge Parkway. 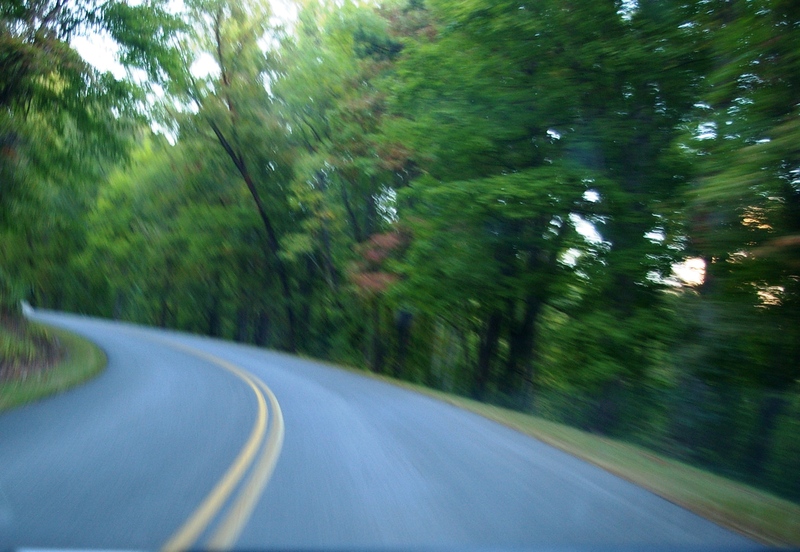 This two-lane black top coils tightly up through and over breathtaking forest vistas. There’s no hurry allowed here, where you share the roads courteously with cyclists, motor cyclists and a few hikers. I turned off my music to devote attention to the sounds in the trees and of my tires on the road. A few of the tight corkscrew turns went on so long that I’d start to get dizzy behind the wheel. At around 6 p.m., when my love was still in full bloom for the Parkway, I sought to describe its coils and turns like thick, velvety cake batter being poured out, layer upon layer into a cake pan. Doesn’t that sound delicious? Photos at twilight bear out the truth of this metaphor. Unfortunately, once the sun went down for good, I was left with dark, curvy asphalt, no street lights and no guard rails. My grip on the steering wheel tightened considerably. Concentrating on those bright reflective yellow stripes on the road as they corkscrewed around and around just made me a bit car sick. Amid the canopy of trees, you really don’t have any sense of how far you’ve traveled, even though your average speed limit was 35-45 mph for safety. When I finally latched onto an exit from the grueling parkway maze, my location couldn’t have been 10 miles different then where I started, even though I’d just spend 3 scenic hours behind the wheel! Follow the yellow lines or it’s curtains! Yes, the Blue Ridge Parkway seems to be a wormhole that folds over on itself. I may have gotten 47.9 average mpg on this leg of the journey, but my overall progress seems like a negative number of miles. After a few turnabouts, I was almost back to Asheville, NC. I corrected the error and was soon bouncing along between all sorts of 18 wheelers on the way to Marion, Salem, Roanoke and points beyond. My eyes burned, my ears ached from popping in the altitude changes, I needed to find a hotel very soon, as it was already midnight. My nerves were worn even more thin by the sudden flash I’d seen by the side of the Interstate soon after crossing into Virginia — two lovely white-tailed doe feeding beside the highway. They weren’t IN the road; only curiously watching, but the damage had been done. Every lump of dirt, every blowing leaf, every flash of something white left me in dread of crashing headfirst into these massive animals on the dark highway. I also noted, as the night progressed and I searched for a place to stay for the night, that my perceptions were askew in a very Fringie way. Diners lit up on signs turned out to be boarded up in person. I drove several times around a Comfort Inn in that left me feeling the opposite of comfortable. A farmhouse across the street looked haunted. Even a nostalgic-looking bowling alley down the street could not ease my feeling of dread. (Was Sam Weiss lying in wait to bludgeon me with size 8 loaner shoes? And why was the state park here called The Hungry Mother? How many souls were wandering these fields after the battle of Marion?) I decided not to find out. After a pit stop to splash water on my face and stretch my tense neck muscles, I vowed to make it all the way to Roanoke. What seemed like a long list of “ominous” portents began to gather. One early attempt to try a hotel left me wondering why don’t they just go ahead and rename it Bates Motel 2? Interstate 81 seemed to cross into and out of the town of Salem several times, making we wonder if the wormhole from the Blue Ridge had followed me. But even odder than several appearances of Salem on exit signs were the curious city signs posted as you drove out of the township. These signs didn’t say “thanks for visiting Salem, come again!” or “now leaving Salem, population 257.” No, Salem’s farewell message was clear: Leave Salem. The dour sentiment was repeated on a second identical Leave Salem sign after the interstate crossed back over the city limits. I was so jumpy from dodging deer and barreling 18 wheelers, I could have sworn the lettering on the second Leave Salem sign had grown larger. The good news is, I am in a motel. Soon I’ll be passed out over this keyboard. I must restore my enthusiasm for Wednesday in case I am able to meet my Fringe Report cubs. I didn’t drive all this way with an assortment of tools, torture equipment, duct tape and adult diapers for nothing! Tags: NYCC, road trip, travel. Bookmark the permalink.